If you are crazy enough to winter camp in northern Minnesota (or most places in Canada for that matter) and want an affordable extreme cold-weather bag, this one should be high on your list. Compressed size is pretty big. Not backpackable. An ahkio or sled is necessary. Look folks, -40 degrees is cold. I mean COLD. Few of us will ever get to experience it. I came close, though. During a week-long winter camping trip to the BWCA in northern Minnesota the night temps fell to -30°F, and probably a few degrees colder. Our group had two cotton tents, neither heated at night, and one solo quinzee, which I opted to sleep in despite a partially collapsed roof. Despite the frigid temps, this bag kept me relatively warm and cozy each night, and I came nowhere near dying. I wore wool socks, long underwear, a fleece hat, and a fleece sweater. Sure there were cold spots at times, IT WAS -30°F for crying out loud. But, I was comfortable and safe. I have made multiple winter trips over the years, with many nights below zero, but none as cold as that. This bag has proven itself each time. Is it perfect? Nope. But it doesn't cost $1,000, either. It's a very good bag for the money. Welcome to Trailspace, Chuck. Thanks for sharing your review of the Dark Star. Glad to hear it kept you warm. This is a warm bag. It was used on a 5-day trip to Ontario in temps that hovered in the upper negative teens F. When I did not roll off my pads, the bag kept me extremely warm. When not on the pads, it still kept me comfortably warm, but with a slight chill. Not at all uncomfortable. This bag is also quick to dry in the morning. These are the only positives in my opinion. The zipper is unbelievably difficult to pull closed the last 6 remaining inches. The draft tube comes loose easily in the night and does not have any clip to hold it at the designated tension. The bag fits snug for broad-shouldered people and is right at its length limit for my 5'10 body. Granted, I should have done some more exploring on length before the purchase. Another issue, this bag is extremely tough to get into the provided stuff sack. Lots of frustration spent in the tent with the gloves off trying to shove this thing back in. It does not want to compress easily. Thanks for the review, Rob. I have synthetic bag that never wants to go back into it's own stuff sack. I finally bought a larger compression sack for it. If I weren't such a minimalist I would have kept this bag. The synthetic fill in this bag is the best and worst thing about it. It keeps you very warm on just about any night, works in moist environments, but it does not pack down small. I traded it with my brother, and his wife uses it for camping while I got his nice down bag that is not rated quite as cold. I appreciate the packability of down. Also, I am becoming fed up with mummy-style bags. I really appreciate leg room, and my next sleeping bag will be semi-rectangular. The zipper, materials, and insulation of this bag are excellent and durable. I bought this bag a long time ago, and it served me well until I had the fast and light revelation. This is a winter bag, so I didn't expect it to pack down super well. I was surprised at how easily I could get it to compress in my Granite Gear stuff sack. It's pretty roomy, so if you're small bring a liner. This product has kept me warm, but I haven't pushed it to its temperature rating limit yet. The bag is very room for me (I'm 5'3"), but many of my tall friends have just enough room for their toes in the toe box. There's lots of room in the hood. I wouldn't mind more insulation around the neck area (there's a draft collar, but it can't be cinched). The bag is easy to get in and out of. For a synthetic, sub-zero bag I was happy with how small I could pack it. You'll have to get a separate compression sack. I got a Granite Gear 31L Block Solid compression sack. Overall, I'm happy with this bag. I've had it for a year, used it during the Arrowhead Ultramarathon and have had no problems with it so far. I have had to buy a compression sack and liner for it. This is a good sleeping bag. I would say it's kept me asleep comfortably up to -10F, lower than that I would not die but would not have a good dream either, which is normal for -40F bag. It comes with a compression bag, very handy, very worth $200. The only bad thing is the filling has been coming out of the every line of inseam since the first day I unpacked it, begging me a question, how could North Face let this happens??? I'm sleeping in this bag everyday this winter, and I guess I need to replace it within the next 2 years... I hadn't tried to wash it in the machine, because I'm afraid a decent amount of filling will come out..
i purchased this as a dedicated cold weather bag (it was purchased used - the prior owner used it for one season). i winter hike in the white mountains, and a zero degree-rated bag was inadequate unless i used it with a liner and a bivouac bag. i slept in this bag in temperatures down to -20 fahrenheit this winter. because i had no experience with the bag, i also used a liner to add some warmth. i ended up shedding the liner and almost all my clothes. i don't know if the bag is as warm as its -40 degree rating, but it was more than enough for -20.
the bag has synthetic fill which is thick and feels bulky. i prefer synthetic fill because it does a better job dealing with moisture evaporation in very cold weather, but this bag is nearly six pounds in the long version - much heavier than a comparable down bag. it has a good draft tube next to the zipper, and double draft tubes at the opening, with a well-shaped hood. the hood and opening pull tight with shock cord and toggles which are a little complicated to work with. it would be a good idea to play with them and figure out how they work before you try to adjust in the dark. 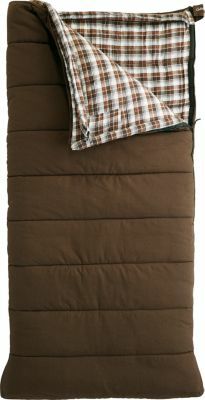 the bag is roomy - plenty of room for inner boots and other gear you may want to sleep with and dry out. some nice features - a glow-in-the-dark zipper pull; a small zippered pocket for essential items, eg a small flashlight, near the top of the bag; and velcro flaps near the zipper that help fully seal the opening against the cold. my only gripe with this bag is fitting it into my pack. 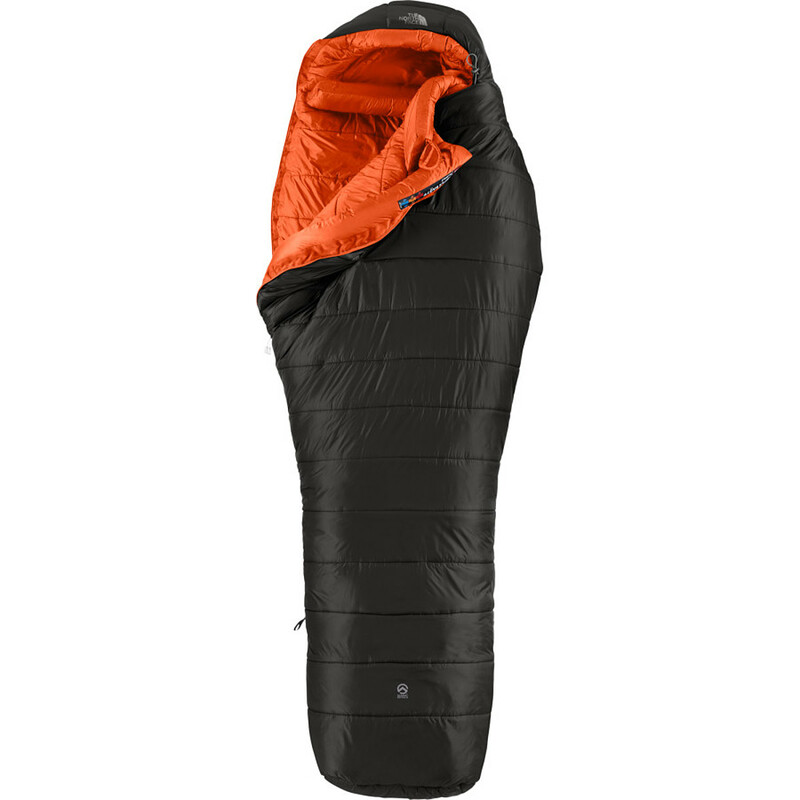 even with a good compression stuff sack, this sleeping bag is comparable to a medicine ball. down bags are much better in this regard. i didn't enjoy cramming the bag into my pack, but i most certainly appreciated the warmth, the good design, and the very good workmanship. words to the wise - do not store this or any other synthetic bag in a compression stuff sack or any other bag that limits the loft, because it could reduce the warmth of the the bag. I recently was camped for a few nights in the Boundary Waters Wilderness here in northeastern Minnesota with temps down to a moderately cold -31 F. I slept plenty warm in the Dark Star, and the -40 F rating seems reasonable. It's probably too warm for temps above about 10 F.
Another review raved about this bag for cold, wet conditions, but if its wet outside, the temp is way too warm for this bag. The drift collar adjustment is a bit weird though and takes some getting used to. I prefer a traditional toggle-lock. The bag is of typical bulk for a true cold weather synthetic bag. 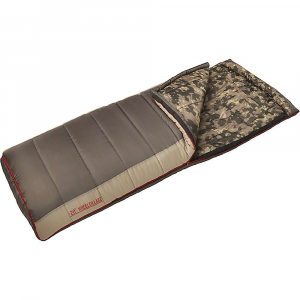 Like with any winter sleeping bag, a warm night's sleep in truly cold conditions requires a good, thick sleeping pad, a fleece hat, and perhaps a down vest wrapped around the feet to fill extra space in the foot of the bag. The good news is that I didn't freeze to death. The bad news is that this bag is nowhere near a -40 degree bag. You can sleep in it when it's zero out but you better where extra socks, pants, turtleneck, etc. Seriously, it was a disappointment and I doubt I'll try another NF bag because of it. I do live in Alaska and have taken this thing all over the state. It has lived up to its price but not its temp rating. I would say this thing is a -30; I've got experience based proof. Last year I slept in the bag just outside of Denali Park in -30 January temps. I did strip down to my base layers but did NOT use a sleeping pad. It was just the bag and the tent floor separating me from the snow below. I was plenty warm in the morning. The bag is a little narrow but otherwise performs well. I question the temp rating by 10 degrees but am satisfied with my purchase. This was the most useless bag i have ever owned. it leaked like a siv and i almost died. if i did not have my bivy cover i would have lost all my heat. I would not recommend the product. I took this bag to Denali and returned with all of my fingers and toes; I never had a problem sleeping. The positive features of this bag: very warm (though perhaps not as warm as I expected); light for a bag of this warmth; beautifully designed and constructed, with all of the "bells and whistles" (e.g., fully adjustable hood, good draft protection, watch pocket, etc. ); no down to get soaked in wet/humid weather. Negatives: quite bulky (though I was able to keep the upper hand with a large OR Hydroseal compression sack); only moderate loft; reportedly mediocre durability (e.g., supposedly the loft will diminish markedly over time). 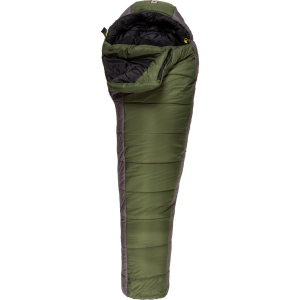 Unless you are willing to shell out $500+ for a Feathered Friends, Marmot or North Face down bag, this is one is a no-brainer for trips to Alaska and other cold destinations where you can tolerate a little bit of extra weight and bulk in exchange for economy and comfort. I bought this to replace another North face synthetic bag that went flat. Nothing against The North Face, they are a good company, but I find all synthetic bags to be lacking in durability and warmth. I used the -40 (F) Darkstar in temperatures that were around plus 15 (F). I would have died if the temp was -10 (F) in this bag. It is just not that warm. I don't know how they test these bags, but the ratings are all wrong. I opted to go for a down bag. TNF was gracious about it and allowed me to upgrade for a modest cost to a -40 (F) down bag from their line. I have a 25 year old down bag from REI that still lofts up like it was brand new. I never got more than 3 to 5 uses from a synthetic bag before it would loose about half the loft and insulation rating. I must admit that I am not a hugh TNF fan however I can say that they do make phenomenal cold weather bags. 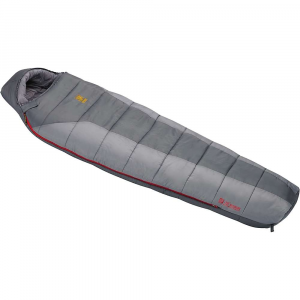 This is a seriously warm sleeping bag, I spent one night in the Whites when the temperature reached -42 F and the bag preformed up to all my expectations -- and then some. The lining feels like soft fleece and it is truely a reward to crawl into this bag at the end of a long day of climbing. The only down side is perhaps the size (both sleeping and packed). I find it somewhat constricting on the shoulders which is something that took a long time to get use to. Also, this is a BIG bag and it's packed size is very big. You definitly need a 100 + litre pack to cary this monster around the mountains. All in all if you are looking for a very durable, Polarguard bag for cold weather use, check it out, but shop around. A side note: TNF introduced a dryloft shell on the Dark Star this year and is, in my opion, a bad move. I can see condensation inside the insulation becoming a problem regarless fo the claims of dryloft. You should seriously reconsider purchasing any synthetic bag with a dryloft or goretex shell. If you really need extreme protection, do what I did and but a goretex bivi. The North Face Dark Star -40 is not available from the stores we monitor. It was last seen March 28, 2016	at Tahoe Mountain Sports.